To help bring awareness to the issue of gerrymandering, I created a web app where you can find out if your district is likely gerrymandered or not. Why Is Gerrymandering An Important Issue? At its core, gerrymandering is anti-democratic. Most of the time, the political party in power at the state level is tasked with drawing the state’s district boundaries. In order to maintain or increase its power, the political party drawing the district boundaries might decide to pack as many voters of the opposite party into as few districts as possible. This is the goal of gerrymandering, which undermines the democratic process from the state level up to the federal level. Gerrymandering is the reason why, despite Barack Obama’s popular vote and electoral college win in 2012, the Republican party maintained control of the House of Representatives. The House of Representatives was intended by our founding fathers to represent the voice of the majority. If congressional districts were fairly drawn, then the House of Representatives would have flipped Democrat in 2012. But it’s not just Republicans gerrymandering districts in Republican-controlled states like Texas and North Carolina. Gerrymandering is also rampant in Democrat-controlled states like Illinois and Maryland. Ultimately, both parties are to blame. 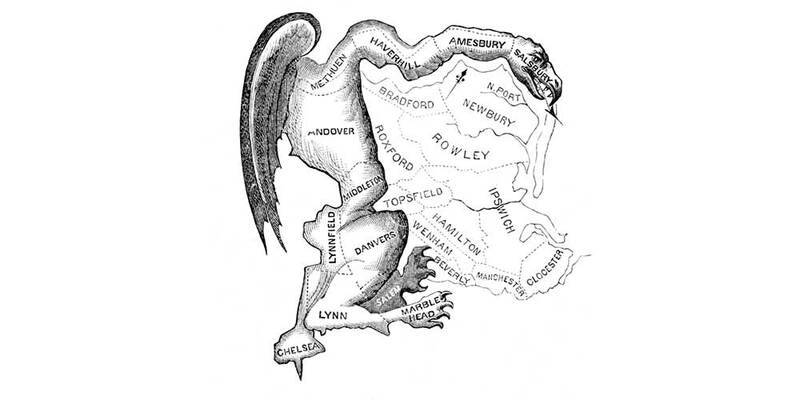 The term “gerrymander” originated due to the shape of districts resembling that of a salamander. Generally, the less compact the shape of a district (e.g. a shape resembling a salamander), the more gerrymandered it is. One way to determine the compactness of a district is to compare the area of a district to the area of a circle with the same perimeter as the district. This is called the Polsby-Popper method, and it generates a score between 0 and 1. The closer the score is to 1, the less likely a district is to be gerrymandered. But the Polsby-Popper method does have its shortfalls, one being that looking at compactness is just one factor in determining whether or not a district is gerrymandered. Another problem is that districts with large amounts of snaking coastline tend to receive a lower score. However, the Polsby-Popper method is generally a good indicator as to whether or not a district is gerrymandered (or at least likely to be gerrymandered). Some states have already started addressing gerrymandering by delegating redistricting to a third party commission. Most states, however, still allow the party in power at the state level to draw up the district boundaries. Because redistricting happens at the state level, the best thing to do is to lobby the representatives in your statehouse and demand an end to partisan districting. Making your voice heard at the state level is the best way to join the fight against gerrymandering.